Replace an old sensor by creating a new sensor ID using a blank aftermarket programmable sensor. Before servicing tires, trigger the vehicle’s sensors by Make, Model, Year selection or VIN scan. (VIN scan option available in North America only.) Triggering the vehicle’s sensors will allow you to identify damaged or defective sensors. If your tool fails to display the sensor information after trying to trigger the sensor, you will need to create a new sensor by selecting the vehicle’s Make, Model, Year or by sensor model. There are two ways to program a blank sensor with the ATEQ VT56. Option 1, select by sensor manufacturer. Next, select the vehicle’s Make, Model, Year. Select CREATE, press OK to create new sensor information. Position the sensor in front of the tool’s antenna. The sensor has been successfully programmed. Option 2, select by vehicle Make, Model, Year. From the main menu, select program, then select the vehicle’s Make, Model, Year. Visit our YouTube page to view more videos about ATEQ TPMS tools. ATEQ participates in several trade shows and events throughout the year to present and demonstrate our TPMS tools and solutions. Visit us to discuss how we can help with your business needs. Contact us for ATEQ TPMS news, media relations or marketing inquiries in Europe, Middle East, Africa or Asia. 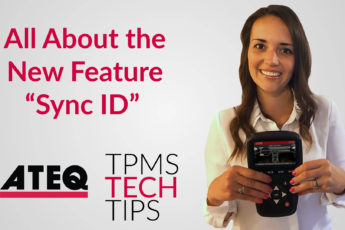 Subcribe to ATEQ TPMS e-news! Receive the latest software technical releases, tool information, trade shows and company news.